Babies“R” Us Sweetest Registry Deal and $50 Babies “R” Us Gift Card Giveaway! Expecting your first little bundle of joy? Registering for all the necessities for your new baby is fun but it can be a bit overwhelming. I know walking into the store I was certainly overwhelmed trying to decide what we would need. Swings, bouncers, bottles, pacifiers, the list goes on and on. I think my hubby and I went around the store 5 times back and forth when we were registering! The best advice I can give is to sit down and make a list of all the items you want before you go in to the store to register. Because when you walk in you will get distracted – especially by all the tiny adorable baby clothes and tiny itty bitty baby shoes! By making a list for yourself you can prevent accidentally forgetting to register for an important item. Pack-and-Play – Great for at home and trips to grandma and papas! 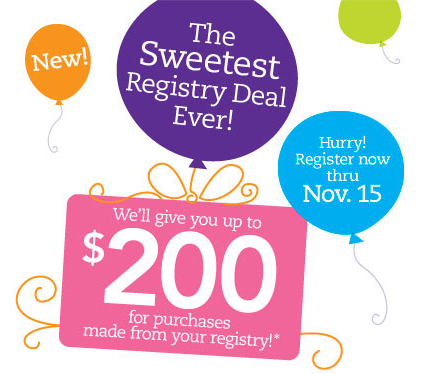 If you’re ready to put your registry together Babies “R” Us has a GREAT deal going on now, the Sweetest Registry Deal! For the first time ever, you can get up to $200 for purchases made from your registry. Simply create your Baby Registry between Sept. 16 and Nov. 15! Then you’ll receive a Promotional Gift Card e-mailed to you approximately 10 weeks after your expected arrival date, valued at 10% (up to $200) of the items purchased from your registry. If you register in-store, you will also receive additional perks, such as a special welcome package, which includes a Baby Registry Planner with a full checklist of essential items, invitation cards to inform family and friends that they are registered at Babies“R”Us, a $5 off $25 coupon, product samples and more. To stay up to date with all the latest deals and news connect with Babies “R” Us on Facebook and Twitter. To celebrate this awesome deal Babies “R” Us is giving one lucky Mommy Digger reader a $50 Babies “R” Us Gift Card! Fill out the form below to enter for your chance to win! The Babies“R”Us information and gift cards have been provided by Babies“R”Us. All thoughts and opinions are my own. I’d like a Baby Jogger stroller on my registry! I really want the baby toddler bed! so adorable.. . the Barbie one! I’d like a baby carrier. I would really like the Frog Bookcase. It would looks so cute. I’d like the Trend Lab Rodeo Princess 6-Piece Hooded Towel and Wash Cloth Bath Set – Purple. It’s super cute and would come in handy during bath time. Thanks. I’d like the Snugabunny swing by Fisher Price. I like the boppy pillows, they are great for feedings and an essential for a new mommy! thanks for the giveaway! I think a swing is a must for any new mom. My son was a hold me baby, but would sleep for a long time in the swing. A baby boppy is a necessity. And now they make them with slip covers. One item I really want from my registry is more cloth diapers!! I really want the Graco Lauren Signature crib. It’s my favorite style and would look perfect in our nursery. One of those joggers would be great!